CONNECT WITH THOUSANDS OF LOCAL CONSUMERS IN 1 WEEKEND! QUALIFIED, EAGER CONSUMERS ATTEND THE EXPO FOR THE SOLE PURPOSE OF MEETING BUSINESSES LIKE YOURS TO HELP THEM WITH THEIR HOME IMPROVEMENT PROJECTS! The cost per lead cannot be matched by traditional means of advertising. OUR attendees represent hundreds of thousands of dollars in business. Make them YOUR clients by reserving your exhibit space today! 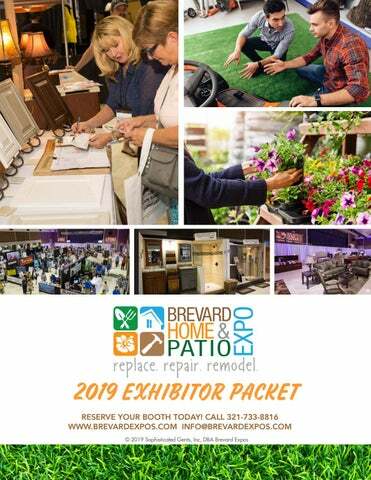 With over 17 years of consumer expo production experience and 45+ Expos under our belt, Brevard Expos provide the ultimate arenas for you to showcase your products and services to pre-qualified, captive audiences. We truly care about your experience in our events and even more importantly, your results. Our marketing expertise guarantees well-attended, professionally orchestrated events with greater than 40% percent of each Expo’s budget allocated to marketing. As an exhibitor of ours, you don’t have to get your business “out there” for all to see. Rely on our marketing expertise to bring the business to you! After exhibiting with us, you will find our customer service and attention to detail are unmatched by any other local show producer. B O O T H C O S T S & S P E C I F I C A T I O N S HALF BOOTH (8 Ft D x 6 Ft W): $450 Booth is 8 feet deep by 6 feet wide with an 8-foot-high backdrop and 3-foot-high draped side rails. There are a limited number of half booths available. Half booths are not available to all vendor categories. Half booths will be sold on a first-come, first-serve basis. This is for the business that has very little to display (i.e. promotional materials only or a couple of small products). We don't recommend having any more than 2 people work a Half Booth. DOUBLE BOOTH (8 Ft D x 20 Ft W): $1,225 Booth is 8 feet deep by 20 feet wide with an 8-foot-high backdrop and 3-foot-high draped side rails. Double booths and larger are for those businesses that have large products to display such as spas, appliances, cabinets, etc. TRIPLE BOOTH (8 Ft D x 30 Ft W): $1,700 Booth is 8 feet deep by 30 feet wide with an 8-foot-high backdrop and 3-foot-high draped side rails. iPAD STAND: +$50 (Does not include iPad; similar to a microphone stand. This is a great way to professionally display photos of your product and/or portfolio.) MULTI-EXPO DISCOUNT Participate in both 2019 Expo and receive $100 OFF ($50 off each Expo). You must pay the $475 retainer up front to receive this discount. NON-PROFIT DISCOUNT We are happy to offer all 501(c)(3) organizations 10% off any size booth space. CARPET: Carpeting is NOT available and is NOT required. If you provide your own floor covering, it must be taped down and not protrude into your neighbor’s booth or the aisle way. S P O N S O R S H I P I N F O R M AT I O N Looking for more exposure? Take your business to the next level by sponsoring the Brevard Home & Patio Expo! Join our long list of distinguished and faithful sponsors who have wisely and consistently invested their marketing dollars in our Expos. You’ll be glad you did. We offer 3 levels of sponsorship– Title “Headline” Sponsorship, Gold Expo Sponsorship and Bag Sponsorship. • Logo/name inclusion denoting Title Sponsorship in Internet and social media promotions AT THE EXPO: • 810 Square-foot booth; (approximately 28’ x 28’) includes electrical needs, 4 six-foot tables, 4 linens, 4 chairs and 2 trash receptacles. Prime “spotlight” booth location in one of the center rows. HURRY!! Only 3 Title Sponsorship Spots Available. Retainers are applied to the final balance. Booths will be sold on a first-come, first-serve basis. Balances must be paid in full no later than 60 days prior to the Expo date. Gold Sponsorship Fee: $1,500 | Retainer Amount: $400 (per Expo) HURRY!! Only Limited Gold Sponsorship Spots Available. Retainers are applied to the final balance. Booths will be sold on a first-come, first-serve basis. Balances must be paid in full by no later than 30 days prior to the Expo date. BAG SPONSORSHIP Supply your branded bags and we will distribute them to all attendees upon entry to the Expo. Please note that the bags must be approved by Expo management. Bag sponsor must also meet minimum quantity requirements as determined by Expo Management. Bag Sponsorship Fee: $500 Retainers are applied to the final balance. Booths will be sold on a first-come, first-serve basis. Balances must be paid in full by no later than 30 days prior to the Expo date. MULTI-EXPO DISCOUNT Participate in both 2019 Expo and receive $100 OFF ($50 off each Expo). You must pay the $475 retainer up front to receive this discount. This discount does not apply for Tabletop spaces in the Lobby. NON-PROFIT DISCOUNT We are happy to offer all 501(c)(3) organizations 10% off any size booth space. BOOTH SHARING, LOCATIONS & PLACEMENT Booth sharing is strictly prohibited. You may not share a booth with another business. Booth placement is not determined until all booths are sold unless you purchase the Center Row Placement add-on as outlined in the preceding section. READY TO JOIN THE EXPO?! RESERVE YOUR BOOTH TODAY! 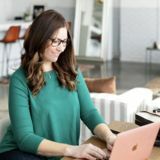 ” Connect with Us Today!